Like a stoned, rambling dialogue crammed with nostalgic reference and scatological gross-outs, Kevin Smith’s pledge of “retirement” has so far wended its way around Clerks sequels and movies where men become walruses, never approaching an end point. And according to Smith, he’s already forgotten what he was talking about: He’s confirmed on Facebook that the invigorating infusion of cash and spite surrounding Tusk made him rethink his retirement plan—and also because “it really fucked with me when the Joker killed my sorta-girlfriend, Maggie Gyllenhaal.” Like Bruce Wayne, Kevin Smith must return to deliver us from a world without grown men playing with toys and talking about superheroes. Hence, a possible sequel to Mallrats. The suggestion that Smith might make a follow-up to 1995’s critically derided commercial flop—which, like many of Smith’s movies, still accrued a devoted fan base—came at the end of a list of his upcoming projects. These include the previously reported Hit Somebody and Anti-Claus, plus Moose Jaws, a horror film the increasingly Lloyd Kaufmanesque Smith described as “Jaws with a moose,” then someone gave him money. And then came the barest of hints that he might be looking to make another return to his View Askewniverse, besides the fact that there’s sunshine and he’s breathing. Of course, “I smell a rat” could mean many things. Perhaps Kevin Smith senses a mole within his organization, betraying his secrets for how to keep getting funding and stars for films based on one-line jokes he came up with while high. Maybe he’s actually planning Rat Trap, a movie where Justin Long plays a realtor who’s lured to a house by an eccentric, disgraced exterminator played by Johnny Depp, who surgically transforms him into a rat for the purpose of chasing him around an elaborate maze. Maybe he literally smells a decaying rat, crushed under the pile of scripts he churned out last week. 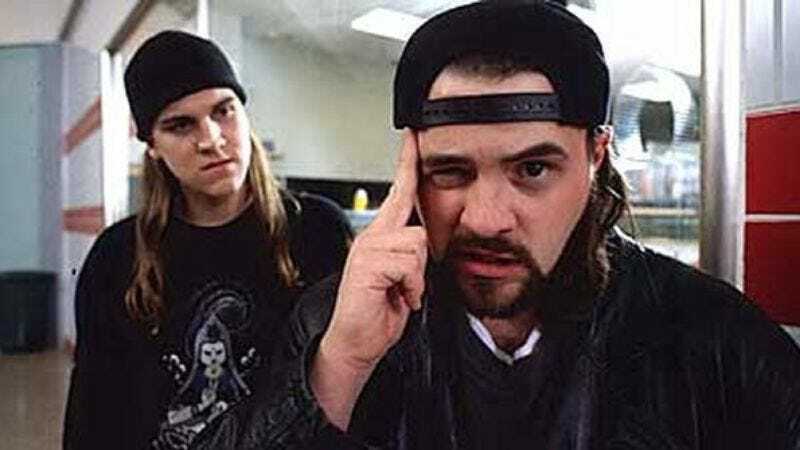 But if Smith’s determination to make Clerks III in time for the original’s 20th anniversary is any indication, he’s most likely looking to do something similar for Mallrats. Maybe this time it can be about actual rats wandering around one of America’s many abandoned shopping malls, having their own idle conversations about dicks and comic books.